Where could i improve and what turrets should i use? So, I was thinking about going all maxed microwave turrets and all maxed napalm, the logic was because even at 25% microwave damage, that is still 2k damage per second so, anything that tries to out range me would get destroyed getting roasted by 3 of those at once.. But, idk because now getting ready for the level 40 push most upgrade take a week or more just for a turret. I have my microwave turrets at level 4 and am doing the level 5 upgrade now which is 5 days... However I WAS thinking avalanche but that is weeks away just from reso and thorium storage increases So, I was thinking maxing microwaves and napalm would be the best also, should i push for rocket silo asap because with cyclones and night owls I can do HH45s in about 4-6 minutes without really take any damage... Or should i push for some specific tech or floating platforms? Go for maxed platforms, the extra health will help and the longest upgrade is a day (after level 3 it is a 5s upgrade). I'm not experienced enough to comment on other types of platform but I've heard floaters are good for defending against night owls and armored platforms are great for tanking. In short, you may as well upgrade your platforms as they offer much greater health at a low upgrade time. Using the same logic attempt to upgrade bunkers to atleast level 5 (this will take about a week for all 5). Napalm turrets are good but I'm not too sure about microwaves, personally I find the AA plasmas good for the air defense waves but air protection can also be created through the use of special forces. In terms of layout, I'd advise that you take the thor storages out and condense the base and use barricades around the bunkers and not just the CC. This will mean that the turrets overlap and can protect each other and can double your damage output if two turrets are firing at the same target. Obviously, finish upgrading all your walls to full. Units-wise, I do love e-valks for quick repetitions of waves and can help to kill thunderstorms fast without taking any damage with the plasma cannon equipped. Not very good for higher waves or against high level players. As in many other areas of the game, special forces are your friend in these situations. Drone silos - night owls if you have them, reaper drones and wing drones if not. The shock on wing drones can stop vehicles dead in their tracks. Do the short upgrades on this to get a bit more capacity. 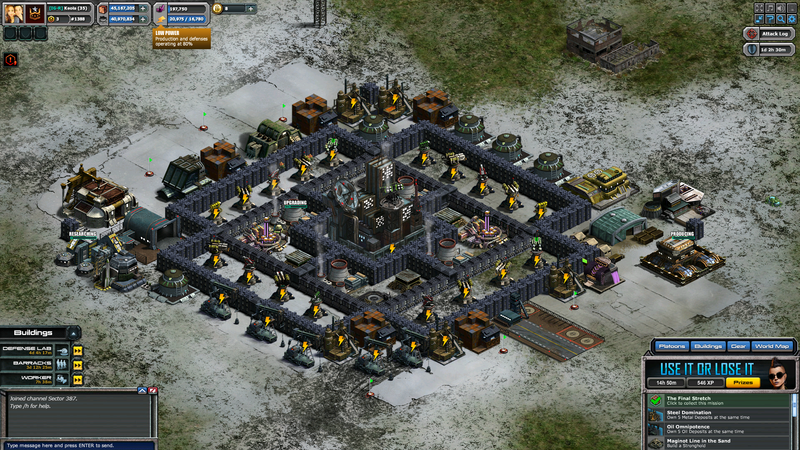 TL;DR Just do the upgrades to defense structures that have the shortest times. Can you post a pic of a base design in mind? I'm interested in more explanation on the overlapping. I''d love it if you showed me! thanks man. napalm really had its day already. its good for halloween event when it can destroy those zombie hordes. i keep 2 max napalm just for that reason. i have 6 microwave, 4 avalanche, and 6 machine gun (all maxed). the thought with that combo is all those can hit air and ground. i will be converting 2 machine gun to avalanche once the dozer is available because of the low range of the MG - it may affect the damage dealt to the flying targets that come overhead though. the thing about all microwaves in overwhelming force is that they all have to be on that target to rack up damage at the outer range which is a hard setup to come up with - the enemy would have to place himself in that location. otherwise, you're looking at about 4 or so getting shots off while the enemy goes after those. i didn't really have a problem with the event layout itself. all the kixeye problems to deal with was what kept me from actually seeing how i was killing off the waves. i did notice that the nightowls and phantoms (event) couldn't harm the airborne platforms, so those where the good ones to place in the path of the phantom. airborne have reduced health, so don't use too many of them. PVP is different than events, so theres 3 ways to layout a base. 1) for PVP. 2) for events 3) for both. i built for #3 because it handles events (which is where we actually get new things to use) and while it still gets bubbled by those that are determined, they lose some high repair time items in the process. someone that wars during the month, would build theirs for #1. now with the base editor, (i haven't tried yet) the base could have a few specific layouts depending on what you're doing that day(week). currently for your level, the base layout isn't bad, i used a similar square layout for a long time. keep working on those platforms and buildings. expect higher levels to roll on through, just play from within the bubble. what i mean by that is go get your thorium (metal/oil) while you have that bubble protection, and have it spent before the bubble comes off the timer. Napalm in those places or requip Napalms there. Yes, this was like I was describing. Since the turrets are closer together they can protect each other now, but since they are only low level platform still, splash damage will be an issue. As I mentioned previously, attempt to get your platforms to the thor level and then they're 5s upgrades. Also, is your mine factory fully upgraded? If not, it's worth looking into as mines become very helpful in event waves, not great for PvP though. Its maxed. You can see red mines in pic. Mine factory, not mines. The mine factory may not be max level with max level mines. Max mine factory = more mines.